GlobTek extends its portfolio with one of industry's smallest 2" x 3" x 1" up to 60 Watt Universal Input Regulated Switchmode AC-DC Open Frame Power Supply for ITE, Medical and Household Applications. It represents the company's entry into ultra-small range of open frame ruggedized power converters, which adds to its existing broad line of wall plug-in, desktop and other open-frame power supplies and chargers optimized to work with our offering of battery packs and other auxiliary power products. The supplier manufactures single and multi-output power devices in both standard, modified and custom configurations. 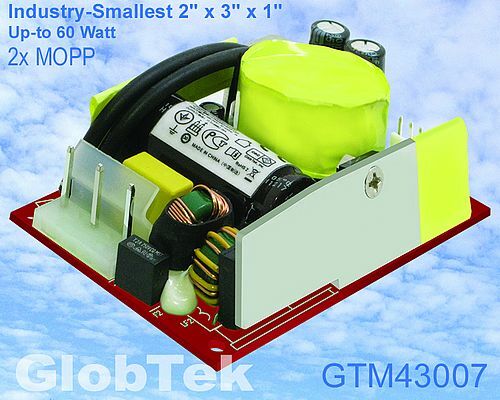 GTM43007 standard features include universal 90 - 264VAC, 50-60Hz, 1.5A input range, output voltages of 5V to 48V, including Industry Popular 5V, 9V, 15V, 24V, 36V & 48V, regulated outputs, full power output without a fan, 50°C ambient operation without de-rating, leakage current ＜100μA@240VAC, Hi-POT:5656 DC/4KV AC,double insulation, low noise 1% or 150 mV whichever is greater, Level V Efficiency.